The Sporting Shoppe at The Preserve is proud to sponsor The Preserve Fishing & Outdoor Report by Todd Corayer now being broadcast on ABC6, WPRO 99.7 FM & 630 AM, WEEI 103.7 FM, with 7 new reports weekly providing timely information for outdoor enthusiasts. Tune-in to find out what’s biting where, get updates on the best seasonal outdoor events and activities, learn about state and local regulations and permits, plus valuable safety tips and information regarding the best gear to get the most out of all your outdoor fun. 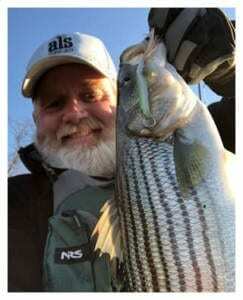 Todd Corayer is a life-long fisherman, hunter, and writer whose Fishwrap column appears in Southern Rhode Island Newspapers and at FishWrapWriter.com. To find The Preserve Fishing & Outdoor Report featured products, and the best brands and lowest prices for fishing and hunting gear, visit The Sporting Shoppe instore or online. Your weekend just got thrice as nice! The televised Preserve Fishing and Outdoor Report is now airing three days a week on ABC6! You can now tune in for up-to-date outdoor reports and seasonal fun every Fridays at 6:25 am, during Good Morning Providence, and Saturdays & Sundays between 7:45 am – 8:00 am during Jack Hanna’s Into the Wild and Soledad O’Brien’s All That Matters. Tune-in every TUESDAY and THURSDAY at 9:33 am during the Tara Granaham Show. Saturday’s between 7:40 am – 8:00 am & between 8:40 am – 9:00 am. Sunday’s between 9:40 am – 10:00 am & between 10:40 – 11:00 am. Kick off your weekend outdoor fun with two Preserve Fishing & Outdoor Reports running Saturdays and Sundays during The Rodney Harrison Show, and NFL Sunday.